Chauncey Banasihan was born on the island of Kaua‘i. 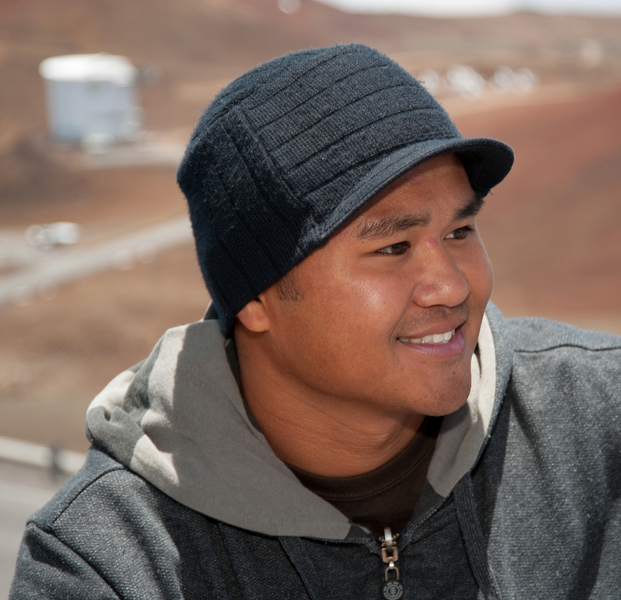 He is currently enrolled in the Electronic Technology and Cisco Networking Academy program at Kaua‘i Community College, and will be graduating in spring 2010. Chauncey is a hard working young man who loves to learn new things. His ultimate goal is to find a great job in a field that he enjoys, have a successful career, and make enough money to support his family. He is also a paddler who loves the ocean, and is currently paddling men’s long distance for the Kilohana Canoe Club. Making music is also one of his passions — he enjoys playing drums and bass and likes to learn new instruments. At the Smithsonian Submillimeter Array (SMA), the Electronics Laboratory is filled with parts, supplies, and tools. The laboratory is an active working environment, but it was suffering from a number of problems: it lacked organization, it did not have much room to work, and parts were sometimes hard to find. My goal was to find a solution that would make it easier for workers to work in the lab, and easier for them to find something when they need it. First, using Microsoft Visio, I created a scale layout of the Electronics Laboratory, and I electronically rearranged the lab to make it easier to access parts and supplies located in cabinets, drawers, and storage units. Once I determined the optimal layout of the lab (and checked that it did not violate any building restrictions), I physically moved the furniture into its new configuration. Second, I created a parts inventory list for the lab, including each part’s manufacturer/vendor name, part number, military number, description, primary function, and location. I chose a Microsoft Excel-based system for the inventory, primarily for Excel’s powerful sorting functions that make it faster and easier to find and keep track of parts. Also, Excel is a commonly used program at SMA, so minimal training is required. Finally, I consolidated parts and items that were spread out across various cabinets and storage units, collecting and labeling them in an organized fashion. With a lab that is now organized and has its own inventory, workers can focus on completing their projects, rather than wasting valuable time searching for hard-to-find items. In addition, the lab now has much more usable workspace, and there is a functioning inventory system that can only benefit the future of the Electronics Laboratory at the SMA.